'Of Other Spaces: Where does gesture become event?' 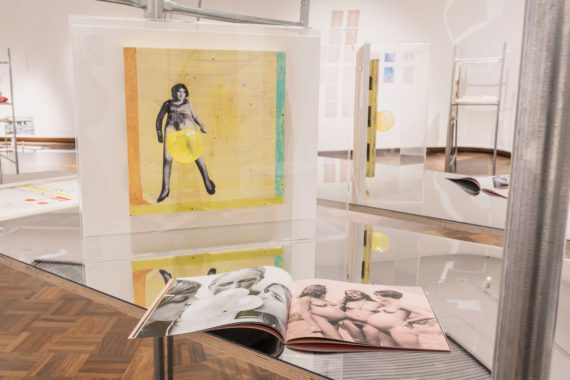 is a two-'chapter' exhibition and symposium at Cooper Gallery, Dundee that presents contemporary and historical feminist art from the 1970s onwards in an attempt to create a dialogue between "artists, thinkers, artworks and practices". 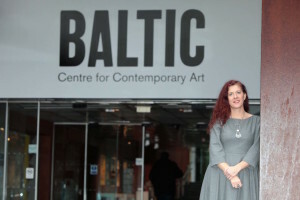 Dundee-based artist Valerie Norris reports from Scotland's 'she town'. Dundee is a city with a proud history of radical and pioneering women. At the height of the jute trade in the 19th century it was nicknamed ‘she town’, due to the unprecedented economic and social independence of the female jute workers. It is an apt backdrop for the new two-chapter exhibition and events programme at the city’s Cooper Gallery, ‘Of Other Spaces: Where does gesture become event?’, which proposes feminist thinking as an active and radical structure for creative and critical exploration. This agenda is clear in chapter one (until 16 December; chapter two begins 20 January) from the moment you enter the gallery via a small vestibule, the walls of which are papered with a collage of historical feminist art manifestos, newsletters, posters, articles and various other items. The title of the exhibition, explains curator Sophia Hao, is a reference to the political theorist Hannah Arendt’s concept of ‘the space of appearance’ – a political space that only comes into existence through action or speech. ‘Of Other Spaces’ is an ambitious undertaking. 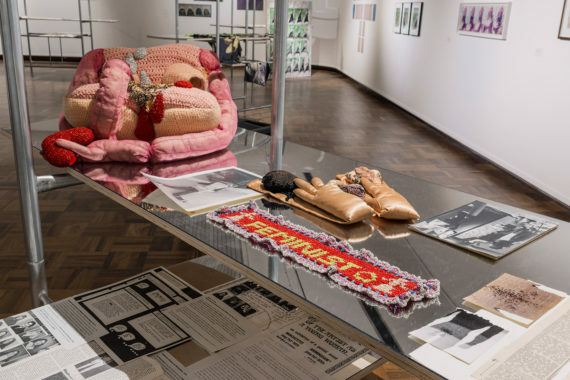 The exhibition is split over two floors and presents a staggering cross-section of material from contemporary and historical feminist art practice from the 1970s onwards. Linking the exhibition throughout is a series of specially commissioned structures designed by the artist duo Cullinan Richards, collectively titled A Modular Infrastructure Acting in Concert with Cooper Gallery. Made from steel scaffolding and mirrored plywood panels, they generously function as both artworks and display units for groupings of work, documentation and archive material. The downstairs gallery features work by Anne Bean, He Chengyao and Mary Kelly, alongside archive material relating to the late, esteemed artist Monica Ross and historical feminist art groups. 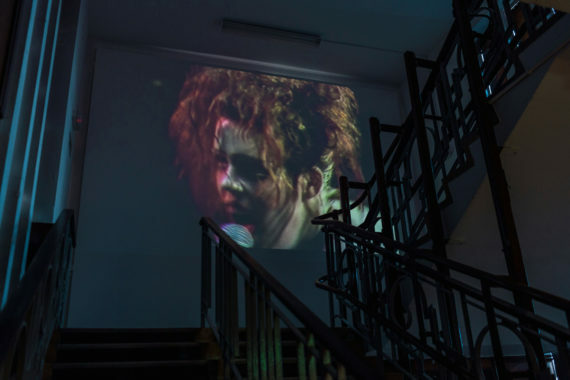 An echoing female voice beckons visitors up a darkened stairwell, past a projection of Linder’s notorious meat dress performance at the Haçienda club in 1982, to the gallery’s upper level. 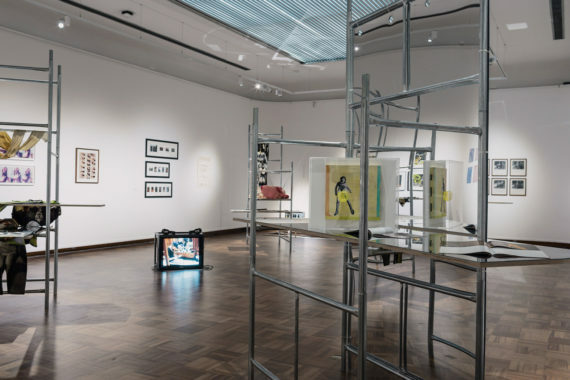 Three structures display artefacts from the collections of Linder, the Women’s Art Library, Lynda Morris and Rose English. The voice proves to be that of English, whose crisp diction narrates a film of her and Sally Potter’s celebrated 1976 performance, Berlin. 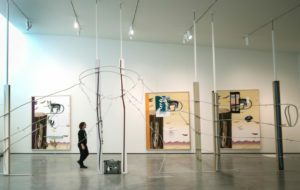 The exhibition continues into the Cooper Gallery itself, where another grouping of six structures evokes the feel of an expo. A multitude of works are displayed, including thought-provoking and provocative photographic works by Alexis Hunter, Rose Finn-Kelcey, Margaret Harrison, Susan Hiller and Jo Spence, as well as Su Richardson’s witty textile pieces and new works by Bean. Linder’s fairytale-inspired costumes and collages sit adjacent to a Cullinan Richards painting. There’s more: Annabel Nicholson performance documentation, posters by Conrad Atkinson and Lucy Mackenzie, a film by Georgina Starr and further historical material. There is a strong sense of dialogue between the past and the present in ‘Of Other Spaces’, and it seems somewhat shocking that many of the issues explored in the works from the 1970s and 1980s still feel relevant and unresolved today. Between them, the works in the exhibition present explorations and subversions of gender, identity, politics, domesticity, consumerism and alternative (un)realities. Speaking about the two-chapter structure of the exhibition, Hao likens it to the process of writing an essay, explaining that she sees it as “a curatorial strategy that extends and deepens the discursive possibilities of other spaces”. An integral part of chapter one is the international symposium, ‘12-Hour Action Group’, on 3 December. The title is a reference to feminist art groups of the 1970s and 1980s, who often used the term ‘action group’ to describe themselves. 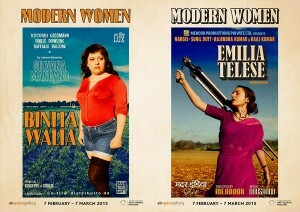 The symposium promises an extensive line up of talks, readings, performances, screening and discussion. Speakers include art historian and theorist Amelia Jones, curator and art historian Lynda Morris, film theorist Laura Mulvey, Adele Patrick from Glasgow Women’s Library and writer and critic Marina Vishmidt. Hao reveals the symposium will be opened by the Scottish writer Kirsty Logan, who subverts the traditional structures of fairytales to explore feminism, identity and sexuality. These themes will be echoed in a performance by Linder, in which dancers will activate the costumes featured in the exhibition, designed by the late fashion designer Richard Nicoll. Following a series of open workshops, there will be a final performance of We Dance Ourselves, a participatory dance event in collaboration with The Space, Dundee, inspired by the feminist dance piece Rosas danst Rosas (1983) by Belgian choreographer Anne Theresa De Keersmaeker. Another strand, ‘content work produce form’, has been co-curated with Edinburgh-based poet JL Williams. Williams has invited 13 women writers to respond to the iconic feminist text History or Not (2000) by Monica Ross, and Feministo (The Women’s Postal Art Event, 1975 – 1977/78), both featured in the exhibition. The resulting work will be presented as a collaborative reading. New live performances by Anne Bean and Hannah O’Shea will be premiered. O’Shea will present a new, collaborative version of her acclaimed durational work A Litany for Women Artists (1976), featuring the names of deceased Scottish women artists. The symposium will also offer the rare opportunity to see a Super 8mm film screening of ‘Firefilm’ (1981) by Annabel Nicholson. Another of her films, ‘Stock Exchange’ (1983), will be screened as part of Chapter Two, which opens on 20 January. Hao explains that chapter two will shift focus to “foreground performance art and video art, two practices critically intertwined with feminist thought and action since the 1970s”. Highlights will include the UK premiere of Linder’s film The Ultimate Form, and Georgina Starr’s 2015 film, The Birth of Sculpture. The closing event for chapter two on 4 March will feature live performances of new work by He Chengyao and Dundee-born Siôn Parkinson. Bean will feature again in a special performance with the feminist punk performance covers band Moody and the Menstruators (1971-1974). 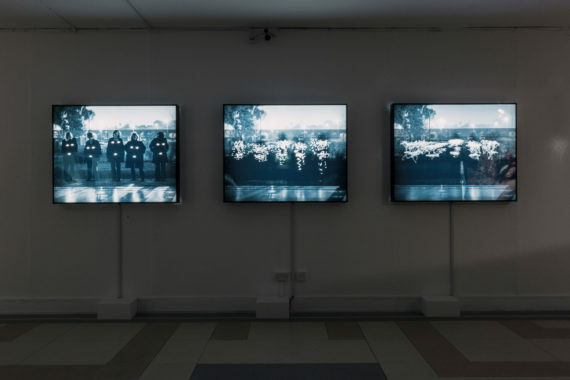 Hao emphasises the importance of alternative politics, self-organisation and “the possibility of otherness” as the focus of the exhibition and symposium, particularly in today’s political and social climate, and as a way of challenging power structures. ‘Of Other Spaces: Where does gesture become event?’ is at Cooper Gallery, Dundee. Chapter One continues until 16 December 2016; Chapter Two runs from 20 January – 4 March 2017. All photos: Ross Fraser MacLean/ Studio RoRo 2016.